This painting shows a lagoon running parallel along the River Hamble (out of scene), in Hampshire, near to the City of Southampton. 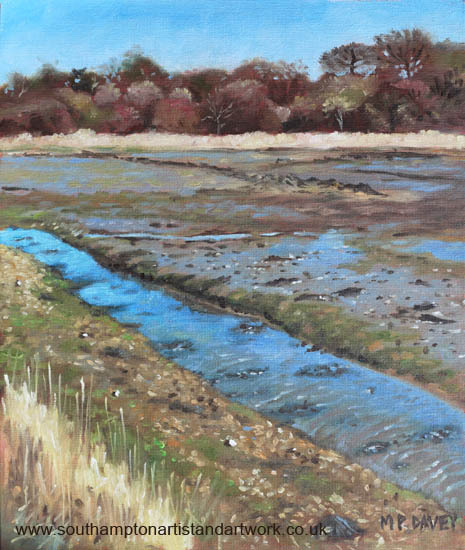 The river was at low tide so revealing a large expanse of mudflats in the area with lagoons interruption the landscape The artist was struck by the prettiness of the scene with the brown wet mud and foliage contrasting with the bright blue of the sky reflecting in the water. This painting was created in April 2014 in an afternoon, using oils on a canvas board measuring 10” x 12.